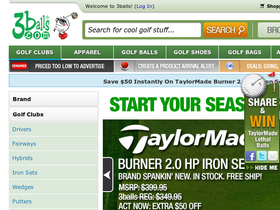 3Balls Golf, online at 3balls.com, has all the golf supplies galore. 3balls has a huge selection of golf gear and equipment so that your ready to hit the golf course. Find golf clubs, golf balls, golf shoes, golf bags, and even golf apparel and accessories. 3balls offers top golf brands including Adams, Callaway, Cleveland, Cobra, FootJoy, MIzuno, Nike, Odyssey, Ping, Tailormade, Titleist and much more. 3balls products are of high quality and vary reliable. So stop by 3balls Golf and see what they have for you but first checkout RetailSteal.com to find 3balls coupon codes, 3balls discounts, and 3balls promotions. Get free ground shipping on 3Balls Golf orders that are $99 and over. Other shipping methods that 3balls offers are Fedex Ground, Fedex 2 Day, and USPS Priority. 3Balls does ship internationally. See website for full details, exclusions may apply. Save up to 75% on golf apparel and accessories on 3Balls.com. Enjoy free shipping on orders of $199+ when you shop online at 3Balls.com. Get $50 off Mizuno MP-52 Iron Sets at 3balls.com. Click link for savings. 3Balls Golf has golf accessories under $10. Click link to shop. Shop golf shoes at 3Balls.com staring at $39.95. Click link now to shop. Check out these drivers under $100 on 3Balls.com. Click link to shop. Spend $75 or more at In the Hole Golf to get free shipping when you use this coupon code. At IN THE HOLE! Golf, take up to 85% off on outlet items. Click link to purchase. Get up to 20% off or more on select GPS products at IN THE HOLE! Golf. Click link to shop online. Save up to 20% on Taylormade clubs and drivers at IN THE HOLE! Golf. Click to shop. Check out IN THE HOLE! Golf and save $130 on select drivers.